Excavation and recovery of the burned keyhole structure. A curious archaeological feature of the Upper Ohio and the Susquehanna Valley of Pennsylvania is the semi-subterranean free-standing keyhole structure (Smith 1976). Its general two - dimensional shape can be easily compared to the keyhole of a door lock (Figure 1). Attributed to the Late Woodland Period (circa AD. 1000 – 1550) the keyhole structure has three principal parts: the body and rock filled pit connected by a trench that is usually an upward ramped tunnel that extends to the main body (Figure 2). One or more rows of postmolds line the outer-most edge of keyholes the exception being the opening around the rock filled pit that remained open for entry and exit purposes. Although the above ground three - dimensional aspect of this feature type no longer exists due to the ravages of time and the elements of nature, certain clues survive in the archaeological record that provide us with a glimpse of their architecture and probable function. Figure 1. Comparative shapes of a keyhole feature and the keyhole of a door lock. Figure 2. Generalized cross-section of a Late Woodland keyhole structure. The floor of the body is often covered with carbonized material consisting of a flattened layer of charred grass thatch overlain by burned sections of saplings that connect with the post-lined pattern of postmolds encircling the wall of the body. Occasionally these are cross - configured suggesting that the saplings were inserted into the ground, then bent inward to form an arbor or igloo - like superstructure over the body and ramp. Slabbed charred bark overlying the thatch and saplings present inside many of the keyhole structures indicate that an outer layer of bark was installed to insure a weather tight shell from wind, rain and snow. Some examples show the presence of a relict drainage trench around the inside edge of the body (Figure 3). Figure 3. Excavation plan of a keyhole structure showing the drainage trench. The analysis of more than seventy Late Woodland keyhole structures from the Unglaciated Plateau of northcentral Pennsylvania (Herbstritt 1995) has yielded clues as to their function. The long axis of these structures is oriented along a northwest, west and southwest line that is also the direction of the prevailing winds in this region. The insulated walls serve as a protective barrier against these winds. A curious modification of the free-standing keyhole structure is the keyhole compound presently known only from those in the Unglaciated Plateau. The architectural design of this unique type of keyhole feature is its incorporation of up to five keyholes joined to a common rock pit (Figure 4). Figure 4. Artist’s conception of a keyhole compound. Fire altered rocks found in one or more areas of the keyhole structure is another clue to their possible function as a sweat lodge. Smith (1976) notes that rocks were commonly piled inside the main body, set to one side near the wall making for easy access to and from the semi-subterranean pit. The excavation of other keyhole structures in the West Branch of the Susquehanna Valley contained abundant fire altered rock scattered along the ramp joining the main body. These rocks always show evidence of reddening on their fractured surfaces. Based on the contents of the keyhole structure identified at the Fisher Farm site (36Ce35) in Centre county, Hatch and Daugirda (1980) postulated that the feature functioned as a smoke house for the curing of food stuffs. Figure 5. Experimental reconstruction of the keyhole structure. Results of experimental research (Figure 5) on the, burning (Figure 6) and excavation of a reconstructed keyhole structure (see top), suggests that such features were used as a food storage facilities (Herbstritt 1995). The interior temperature of the structure could have been controlled over extended periods of time during warmer conditions. Information from the experimental work and follow-up excavation of the reconstructed keyhole demonstrated that the archaeological evidence alone could not provide the necessary information revealed through the experimental reconstruction. All said, given the present state of knowledge it may be assumed that semi-subterranean keyhole structures were likely multi-functional as their uses probably varied over the course of the year from sweat lodges to smokeries to food storage structures. Figure 6. Burning of the keyhole structure. 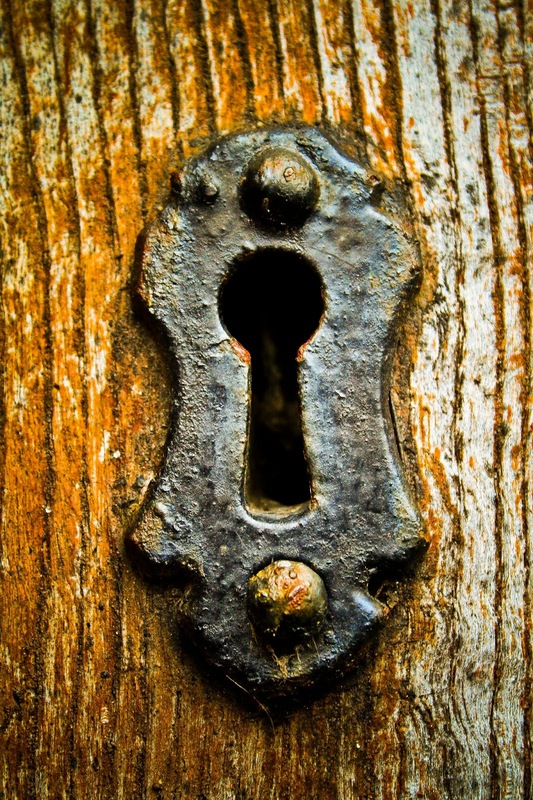 We hope that you have enjoyed this brief presentation on keyholes from the archaeological and experimental perspectives. Learning from the past through archaeological investigations or experimental archaeology is important to understanding and appreciating our cultural heritage. Please help us to preserve the past by collecting responsibly and respecting our preservation laws. Do join us next time when we will again bring you yet another fascinating topic on This Week in Pennsylvania Archaeology. 1980 The Semi-Subterranean Keyhole Structure at Fisher Farm – Feature 28. The Fisher farm Site: A Late Woodland Hamlet in Context. Edited by James W. Hatch. Occasional Papers, No.12. The Pennsylvania State University, Department of Anthropology. 1995 Reliving Prehistory: The Experimental Archaeology of a Keyhole Structure. Paper presented at the 66th Annual Meeting of the Society for Pennsylvania, Inc. Morgantown. 1976 A Functional Interpretation of Keyhole Structures in the Northeast. Pennsylvania Archaeologist 46(1-2): 1-12.